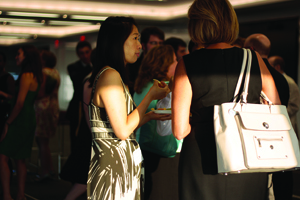 Nearly 80 alumni, including Tracy Kwon ’07 (left) and Jill Golden ’81 gathered for a reception in New York City this summer. This summer, the New York City Connection and the New York Business Network teamed up to host a reception for students with internships in the city. Organizers Cong Cao ’07, Robert Steelman ’92, and Connection co-chair Lily Ng ’08 sought this opportunity for the students—many of whom will look for full-time jobs in New York City in the future—to meet alumni with wide-ranging interests and experiences. The event was a great success, drawing 78 attendees, and the organizers hope to replicate it next summer. In addition to the organizers, we thank James Gregory ’85, who arranged for the event to be held at Proskauer Rose LLP.